These protein-packed morning oats are another great variation of a healthy and hearty breakfast! We even have a nice little portion of veggies in it as well that you won’t be able to taste but will pack your breakfast with nutrients! 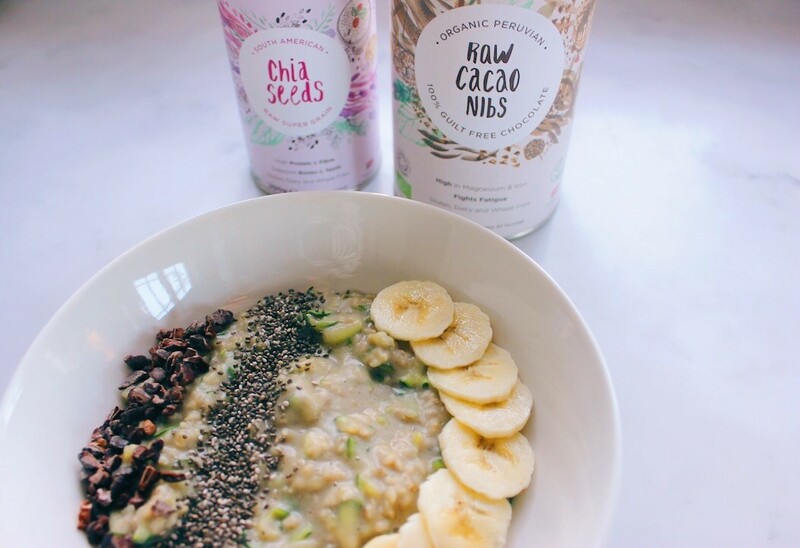 Top the oats with any fruit, seeds or other toppings of your choice, but we have chosen some banana, chia seeds and delicious cacao nibs to give a variety of textures, fibre and taste! 1. Combine oats, milk, vanilla, cinnamon, protein powder, sweetener and courgette in a non stick saucepan. 2. Place over a medium high heat for a few minutes, before bringing it down to a medium heat once it starts warming though. 3. Heat for 6-8 minutes, stirring regularly until you have reached your desired consistency. 4. Serve into a warm bowl and top with toppings. Enjoy!